Puck Custom Enterprises, a premier Iowa-based manure application equipment manufacturer, is excited to announce a limited-time offer on its industry-leading hose cart technology. 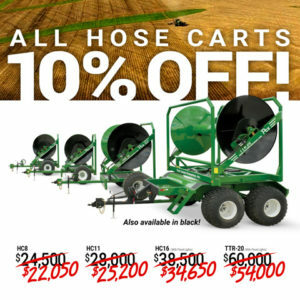 Beginning in April, all four PCE hose cart models are 10 percent off, bringing savings to customers who are looking to upgrade their application operation. This special extends to all of PCE’s hose carts, including the HC8, HC11, HC16 and TTR-20 models, the last two of which come with built-in flood lights. Puck Custom Enterprises’ hose reels are developed to handle tough field conditions, allow faster cycle times and minimize hose damage, with the design process influenced by PCE’s dual role as a manufacturing and application company. The carts are built for easy, single-person operation, able to be controlled from the tractor cab. They are also crafted to decrease downtime, with robust control and strong pulling power, as the hose can be deployed by powering it off the reel. The PCE Arch Guard and smooth edges help protect the hose from damage and going over the reel end, while the single axle with suspension increases clearance and makes application run smoothly in rough fields. The hose cart special began in early April and will be offered for a limited time. PCE’s hose carts are available in black along with their traditional green color. For more information or to place an order, call PCE’s office at 712-655-9200 or toll-free at 833-655-9200.